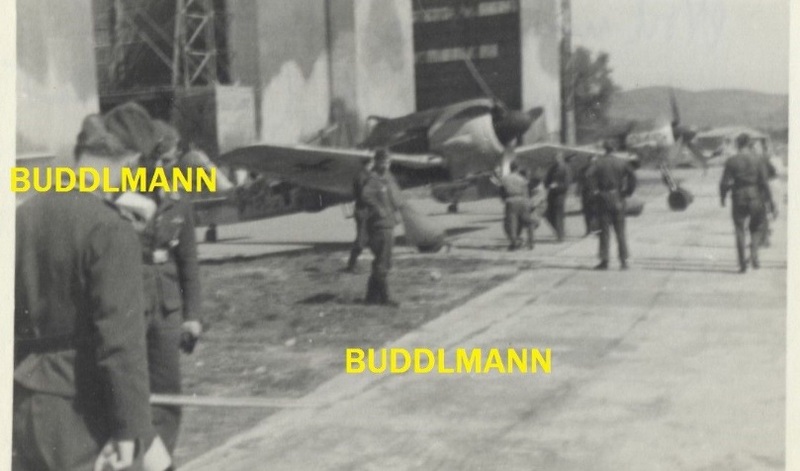 " ..our birds in front of the airship hangars.." NAG 13 Fw 190s presumably at Cuers-Pierrefeu, north of Toulon, around May-June 1944. 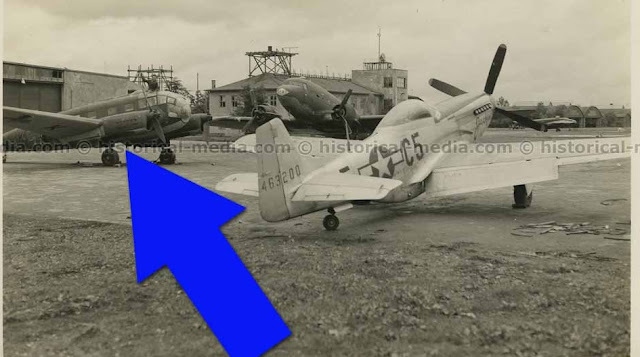 Below; via wiki a view of the French naval air base Cuers-Pierrefeu, located 5 km north of Toulon, in September 1944. 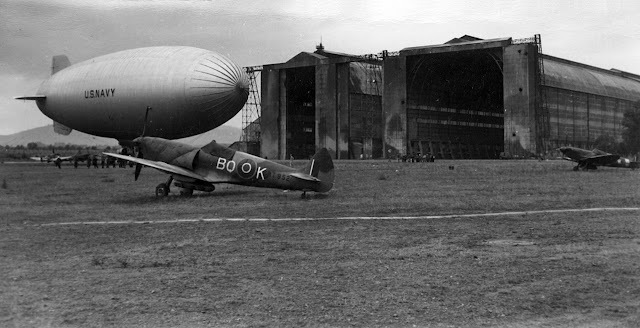 The U.S. Navy blimp squadron 14 (ZP-14) was based at Cuers-Pierrefeu, blimp K-112 (shown) was the first to arrive on 17 September 1944. 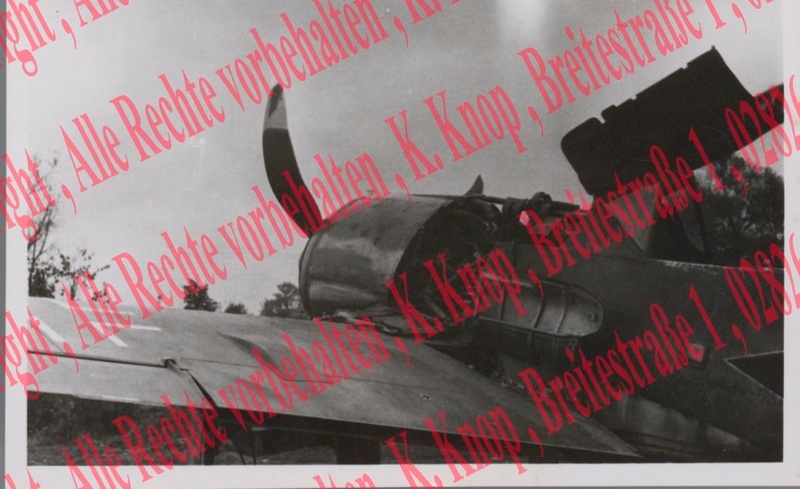 Also visible are Supermarine Spitfire LF Mk. VIII fighters of No. 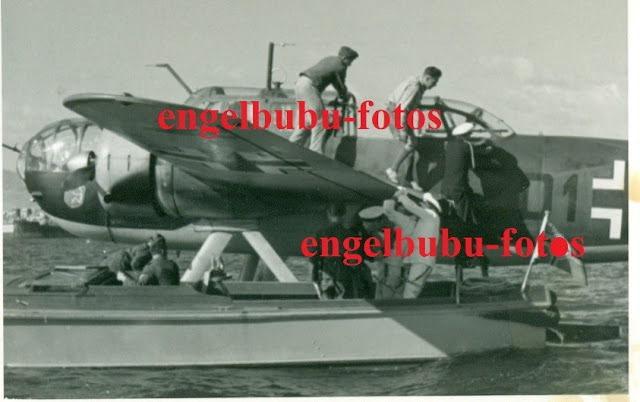 451 Squadron, RAAF (in the forground is s/n MT952). 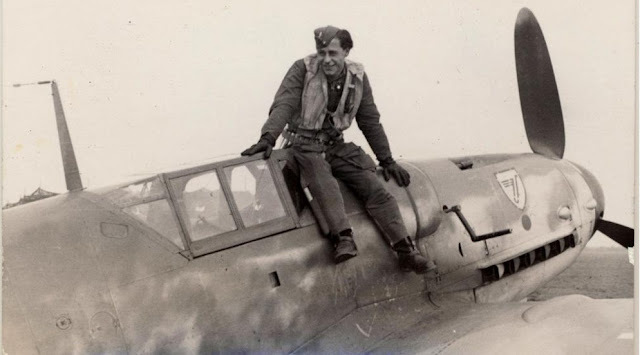 2./Nahaufklärungsgruppe 13, equipped with Bf 109 G and Fw 190 A, was commanded by Oberleutnant Walter Erhard, and sent to Cuers "a few weeks" before the Allied Landings in Normandy. On 14 June 1944 Erhard was reported missing near Ajaccio in Fw 190 A-3 W.Nr. 130340 during a sortie over Corsica. On 29 June Ofw. 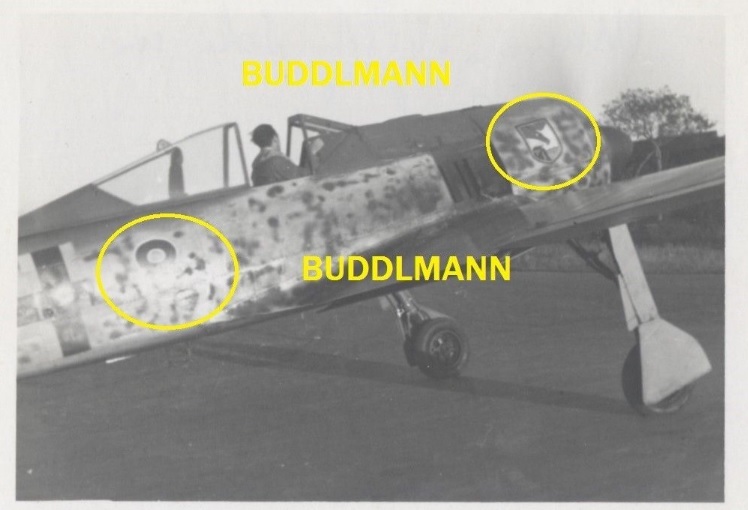 Wilhelm Stockburger was reported missing in Fw 190 A-4 W.Nr. 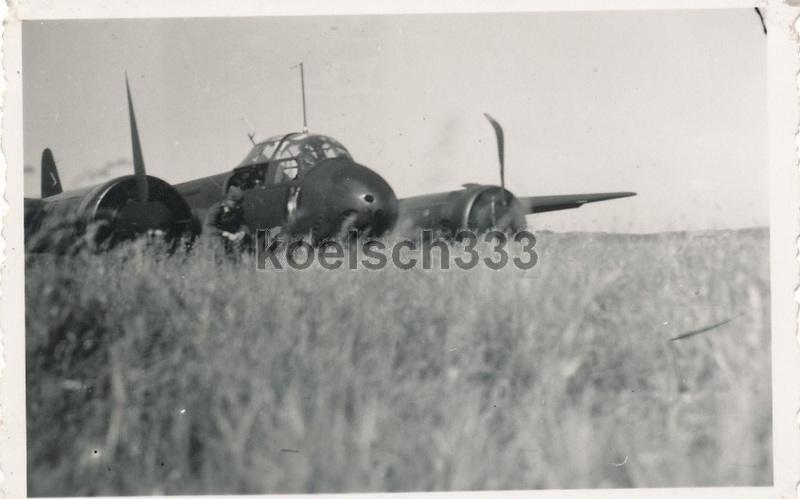 145656, MIA following combat five km south of Nice. 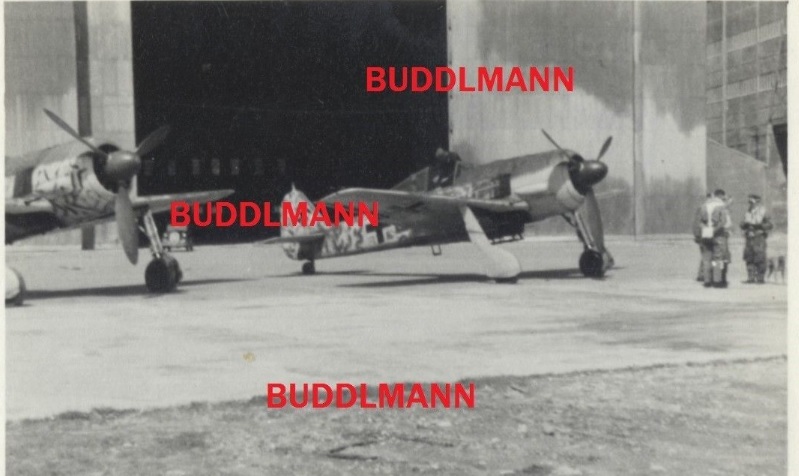 This is Kevin Callahan's fine Academy 72nd scale Me 163 with post-war French registration, a representation of an example seen post-war at French AF flight test centre Bretigny (Centre d'essais en vol) where according to the 'Flugzeug Profile' text below it was flown as a glider. It is believed that this machine was WNr. 10061 'yellow 13', previously allocated British AIRMIN No. 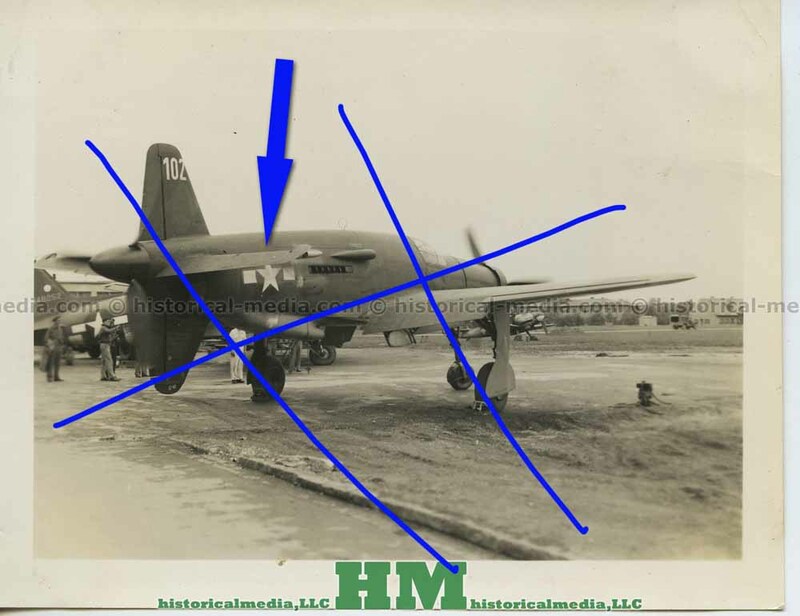 '203' and which was handed over to the French during March 1946 ..
....Komets are simple kits. I used the Academy version which I had in the stash. The one trouble I had was with the Master turned brass pitot and gun barrel set. Since this was an unarmed glider, I didn’t use the gun barrels and the pitot proved to be close enough to scale and is admirably thin. 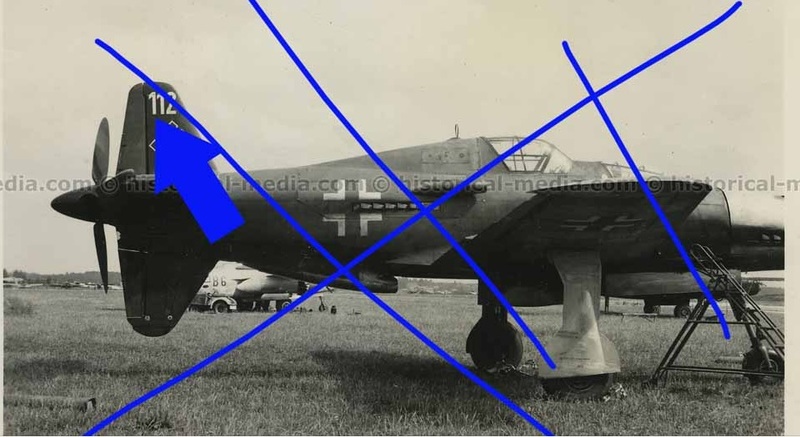 Me-163s are one of the few aircraft that I have done a long series of ...... 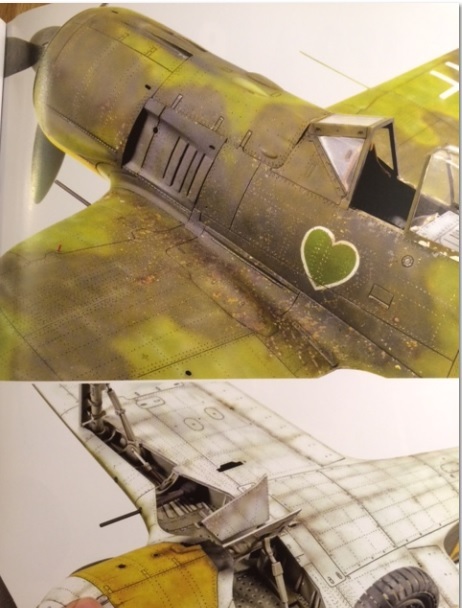 The attraction is that there are nice models – specifically Academy – of the main variants, and numerous kits – in both plastic and resin – of many of the lesser known variants. I supposed you could consider much of the Lippisch output to be in the Komet bloodline, since many of them strongly resemble the Me-163s. But even the major 163 subvariants (DFS 194, A, B, S, C, P-20 jet, I-270, 263, J8M1) are pretty well covered. 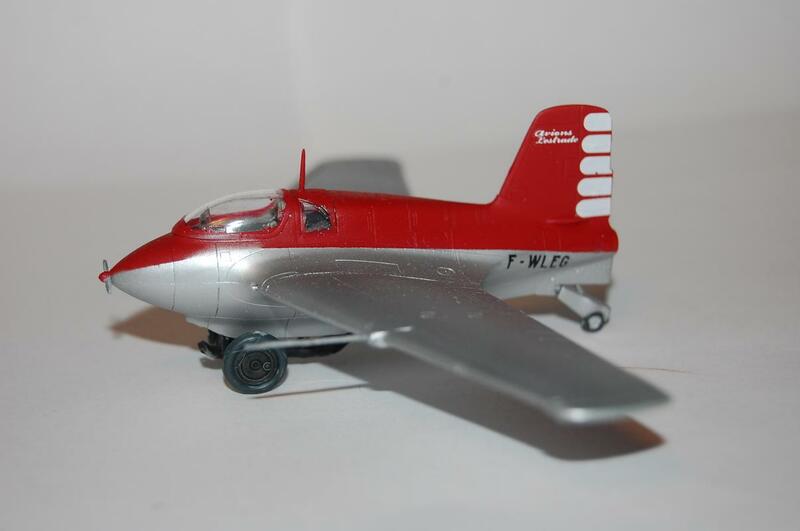 Painting was easy, with only two colors (red and Alclad White Aluminum) required on the fuselage/wings. The decals also performed as expected. 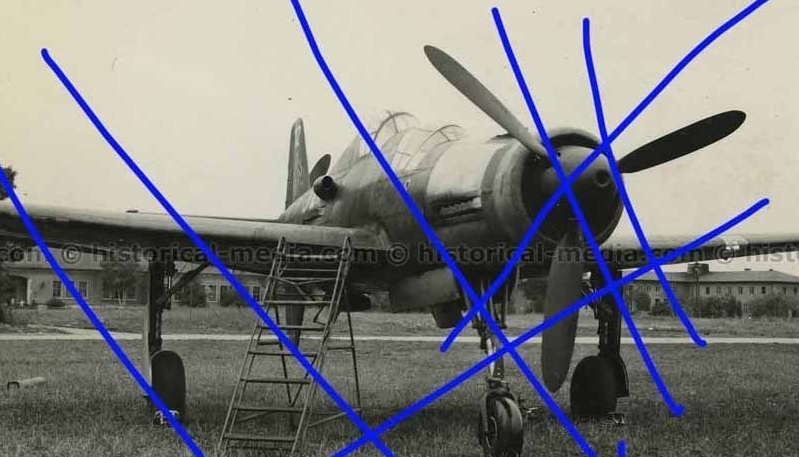 The result is a fairly unique model in any lineup of Me-163s..."
below; the red dot indicates II./JG 3. The latest Prien/Stemmer/Bock Jagdfliegerverbände volume arrived here a while ago -apologies for not talking about it sooner! I do appreciate of course that this volume has been out for a while and there is probably no need to introduce this series to the hard-core enthusiast. There is even talk that Vol 13/III may be published soon as well - see the annoucement from Jochen Prien below. 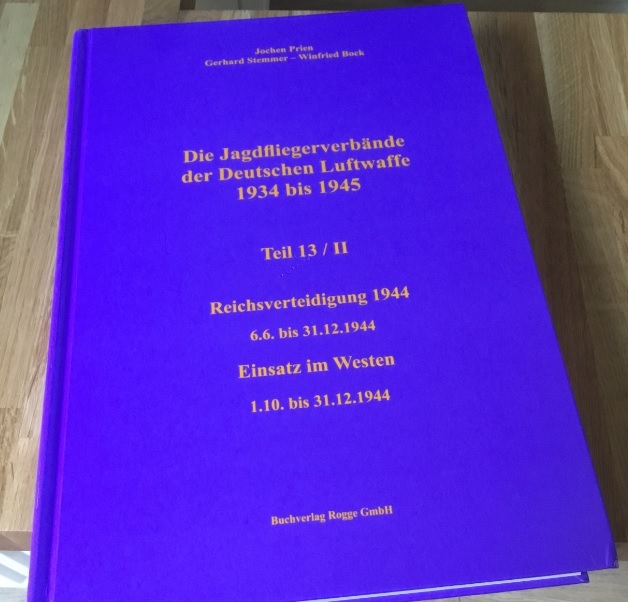 Volume 13/II is entitled Reichsverteidigung 1944 and covers 'Defence of the Reich' from June to December 1944 and operations in the West from October 1944 to the end of that year in 600 pages of closely-typed German text. 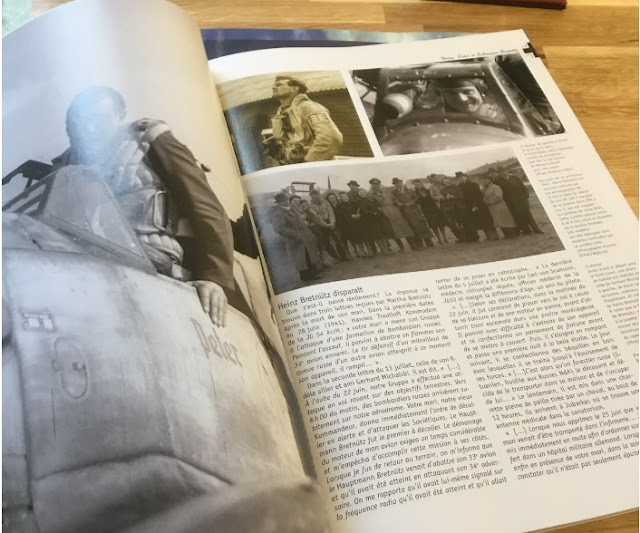 The photo content is quite simply amazing and superbly reproduced on thicker, glossy paper with many images via the 'Archive of Modern Conflict'. Look out for some colour shots of JG 300 Bf 109s and a good number of rare images of JG 302 machines. There are many other photographic highlights, one of my personal favourites being a view of Gkr. Siegfried Lemke of III./JG 2 with his pilots in front of some of the unit's Fw 190s dating from October 1944. 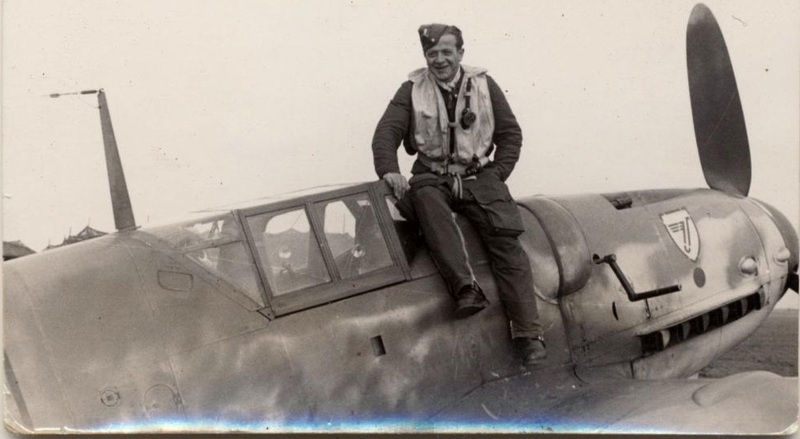 Lemke is of course a pilot about whom very little is known. "...tomorrow the complete manuscript of JFV 13/III will go to the printer. 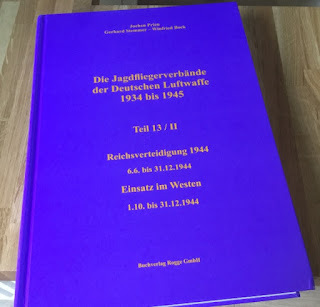 It will cover the service of the Luftwaffe day fighter units in the West from 1 January to 30 September 1944, thus completing the narrative part of the year 1944 for Reichsverteidigung and the West. The new Volume will comprise 678 pages with 246 photos. Vol. 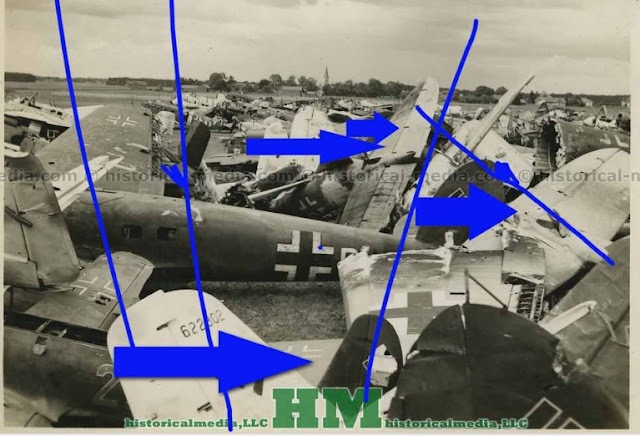 13/IV and V will complete this part of the series with the usual General Part - command-structure, strength, newly introduced a/c types, camouflage and markings etc. 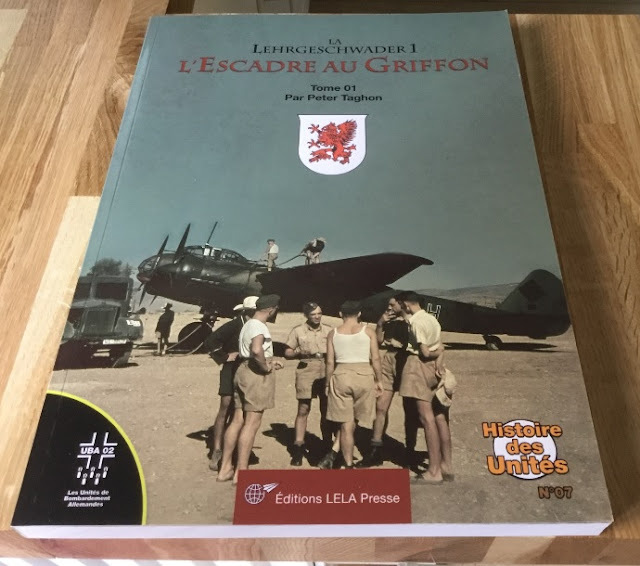 - a very short summary of each unit's service and of course the usual tables with claims and losses etc..."
New from Lela Presse is this reissue (in French) of Peter Taghon's LG 1 history (Volume 1). 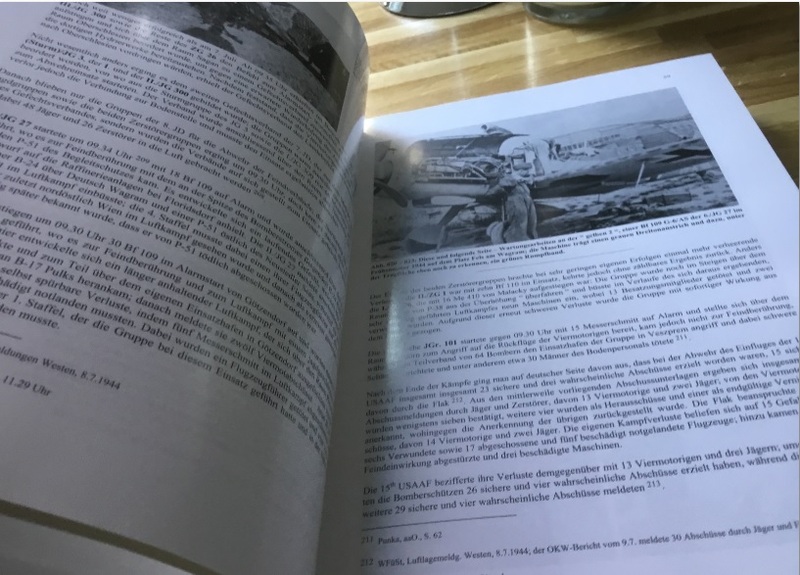 While this is a soft-back card-covered book, the paper is nice and thick and glossy and a world away from the thin almost see-though paper of the original German language edition. 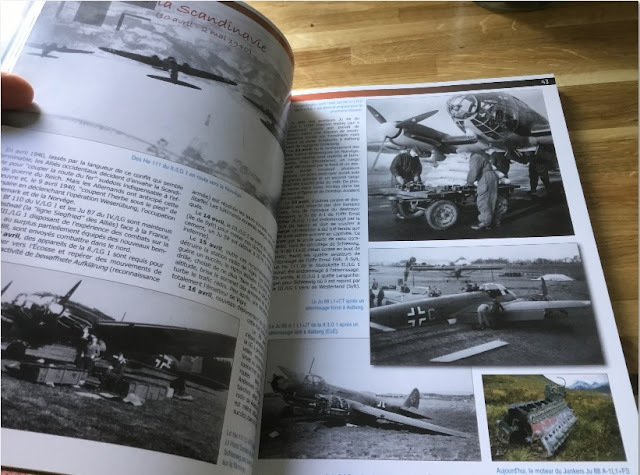 So the reader can enjoy much better photo reproduction, Thierry Dekker artworks and a Bundesarchiv colour series devoted to the unit - some of the images are reproduced in full A-4 page size. 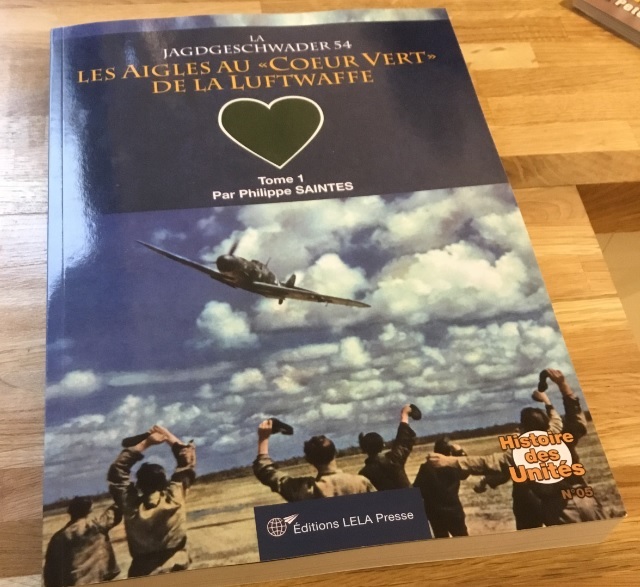 Taghon's book was of course largely devoted to personal accounts by the veterans themselves and is thus very 'immediate' with little in the way of footnotes or other obstacles to hamper 'readability' (aside from the language issue if you can't manage the French of course..). .. My (purchased) copy of Philippe Saintes history of JG 54 arrived from Lela Presse. As an 'Avions' subscriber you get a reasonable discount. I've only spent a short time with my copy before going to work, but it looks great. A very nicely done volume - card covered softback, thick glossy pages. Loads of images -850 according to the blurb- over 304 pages. 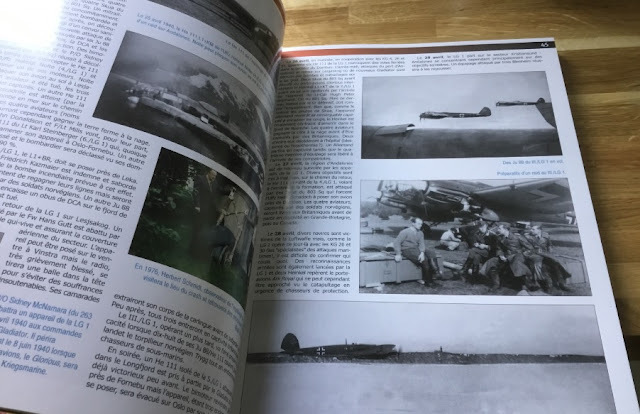 A small amount of over-lap with another recent JG 54 publication. Some profile artworks vertical full page, others are printed across the A-4 page horizontally and are much smaller. I noticed that the photo of the actual machine is more often than not printed alongside the artwork.Some colour pics. All of it well crammed in. French text. Admittedly not 850 photos as advertised - apparently there are 'only' 813 photos within the book's 304 pages. Not bad, and while some photos look a little 'dodgy' this is a good replacement for the 'old' Schiffer JG 54 photo album! 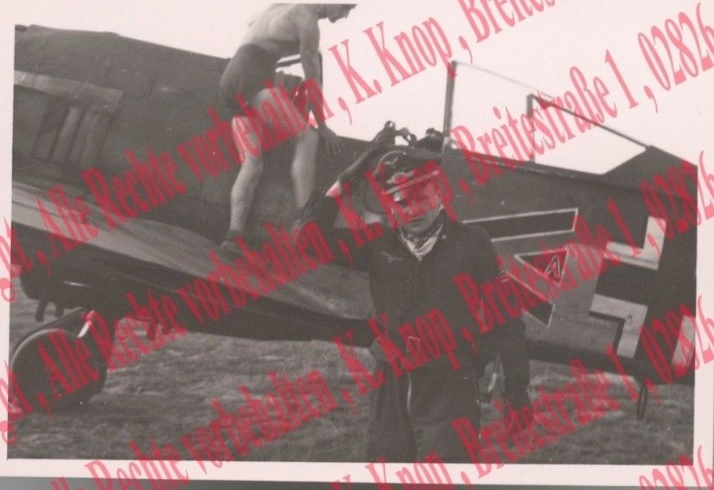 As for 'known' photos, well of course, you could hardly leave them out without spoiling the 'story'. 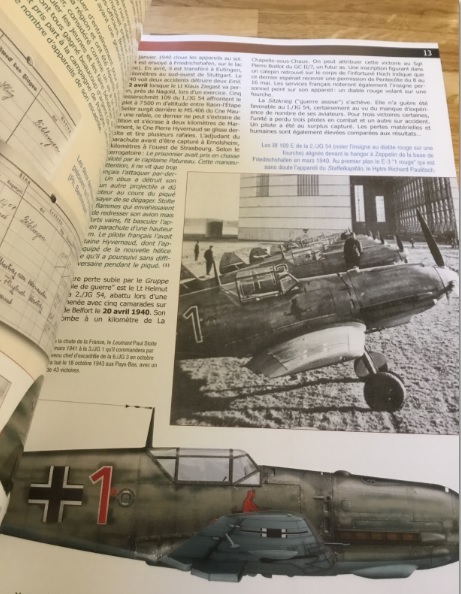 Of course Philippe's 2-part history of JG 54 is no photo album, there being acres of text and thirty colour profile artworks. There are plenty of images that are 'new' to me although some of them are necessarily a little small. 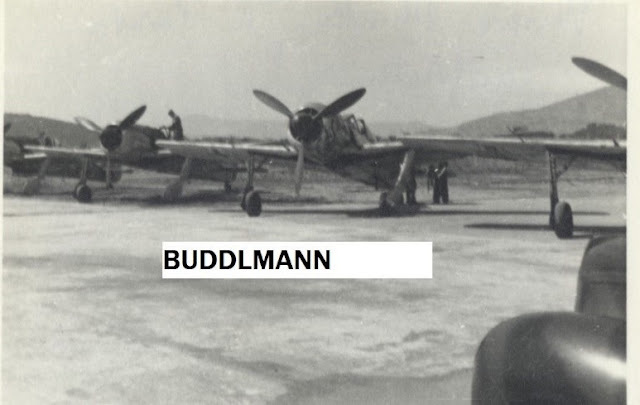 And for every page 221 ( a view taken from the ground of a Staffel at altitude) you have a page 261 (four views of Helmut Biederbick's Bf 109 F 'white 7'). Publisher Lela Presse is here and you can download their 2018 catalogue as a PDF. A quick mention for the latest issue No. 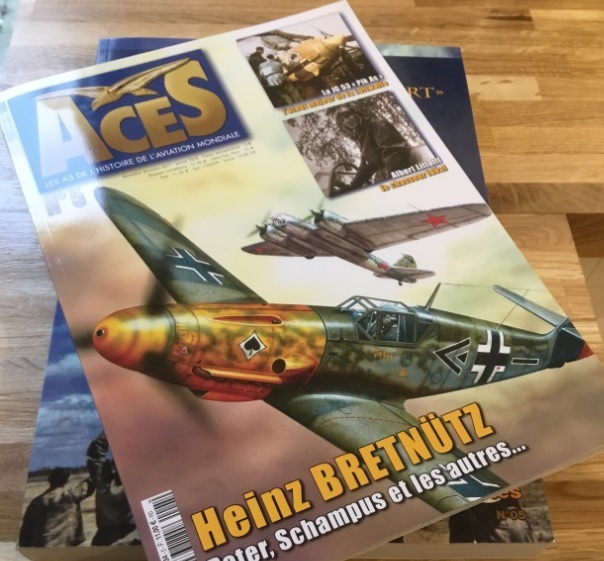 5 of Many Souffan's "Aces" quarterly from Heimdal - something of a JG 53 'special' with over 70 pages covering the unit and its personalities. A fine card covered publication with stiff spine, recommended! Of particular interest was the article devoted to fighter aces and their relationships with the propaganda services of the Reich including Luftwaffe PK reporters, illustrated with rare ECPA-D photos. 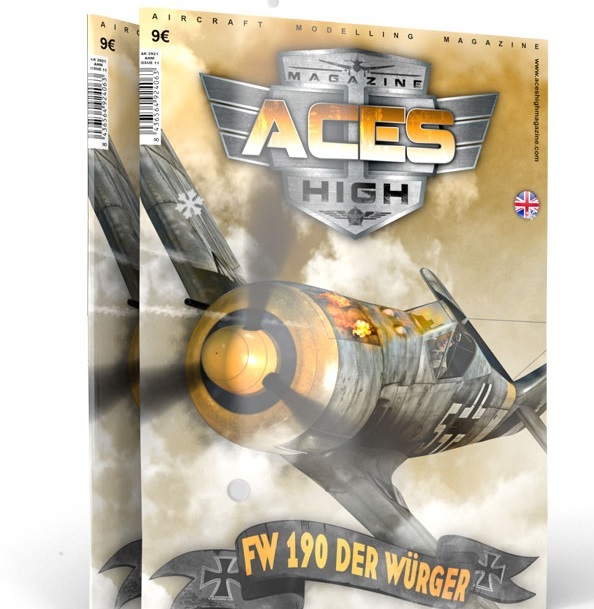 The latest issue of 'Aces High' from AK-Interactive has arrived. 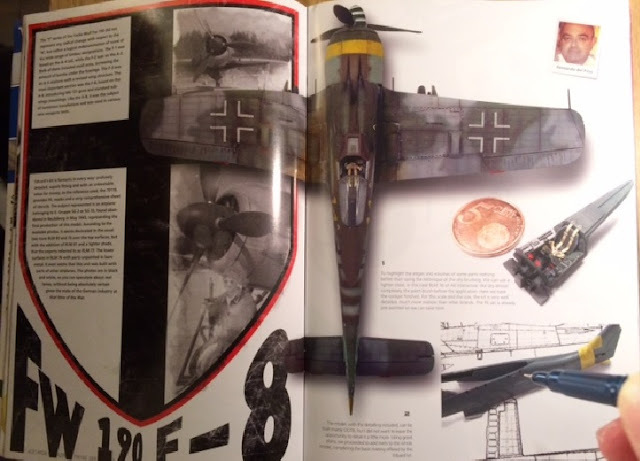 Issue 11 is something of a 'first' being devoted to a single aircraft type, in this instance the Fw 190. Designed essentially to promote their series of weathering products this is another superbly produced magazine. 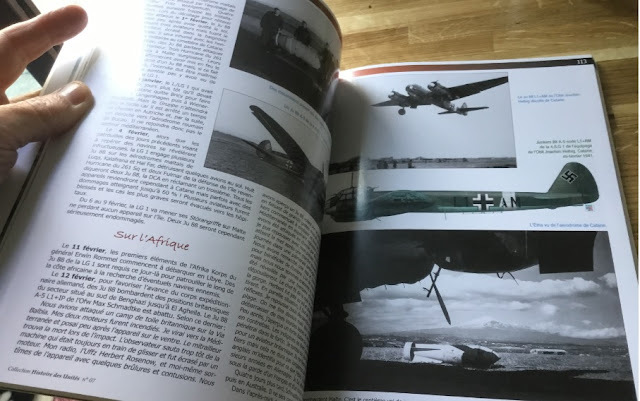 According to Luftwaffe blog correspondent Laurent Friedine who has already purchased it, " le résultat est très agréable et donne envie de passer à l’action..". - ..very nicely done and certainly inspires you to get down to action straight away! 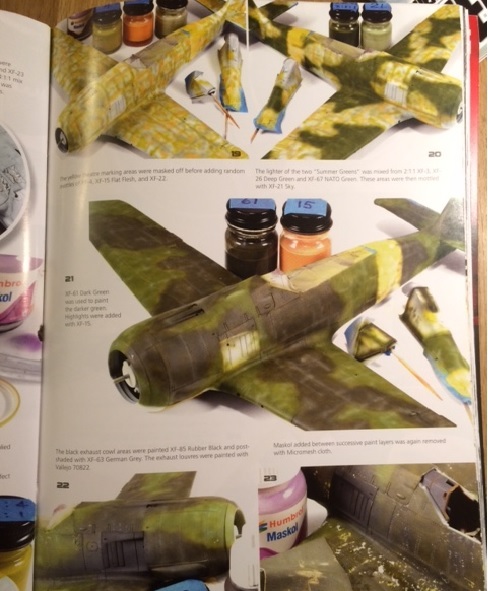 Inside there are lots of builds from talented modellers based around photo coverage and detailed how-tos on camo schemes and markings with plenty of hints and tips on finishing your latest Fw 190 and above all plenty of inspiration to get going and actually build something! 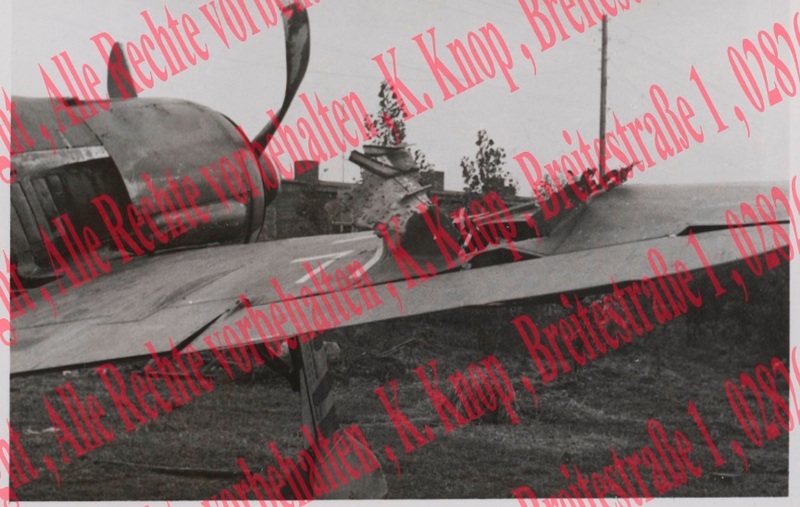 ( ..the JG 54 A-5 is magnificent!). Joyeux Noël et bonnes fêtes de fin d'année a tous mes correspondents français et belges! amazing photo series currently on offer from an album in the family of Ritterkreuzträger Ernst-Christian Reusch. ERNST, Otto. (DOB: 05.02.10). (DKG). 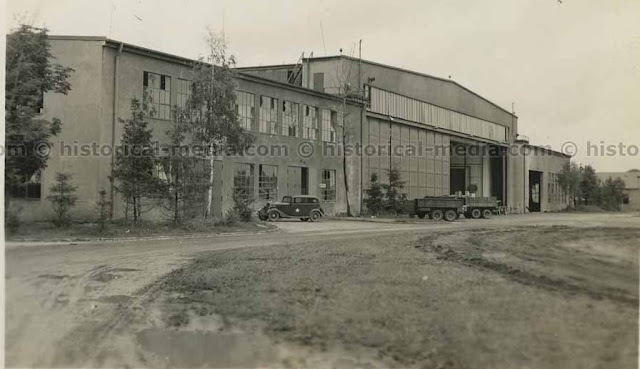 01.12.39 Hptm., in St.G. 51. 09.41 Hptm., appt Kdr. Stukavorschule 2 (to c.02.42). 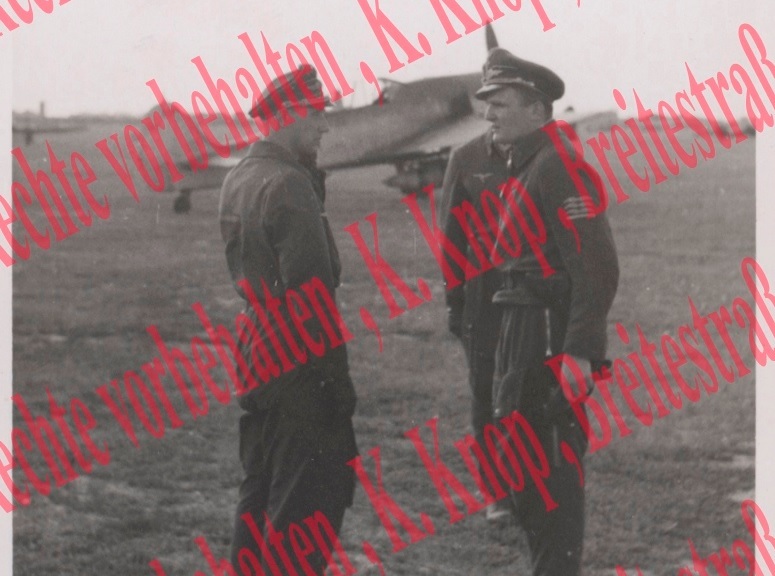 01.04.42 promo to Maj. 01.03.43 Maj., awarded Ehrenpokal. 08.43 Maj., appt Kdr. II./St.G. 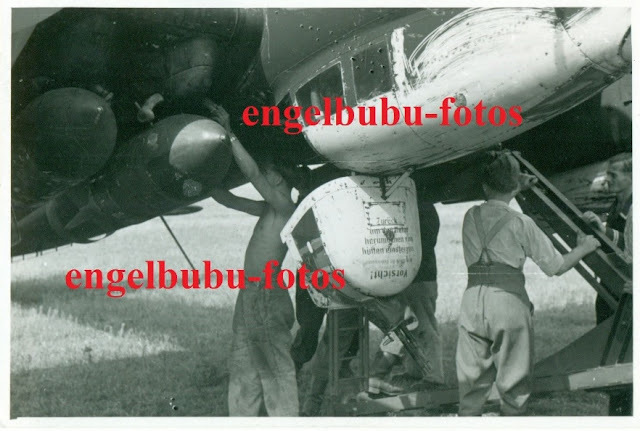 1 (to 13.10.43 WIA). 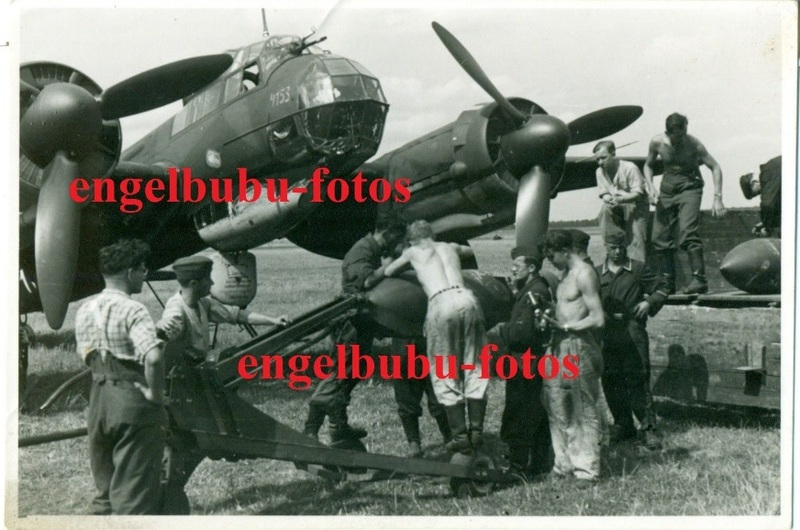 31.08.43 Maj., awarded DKG, II./St.G. 1. 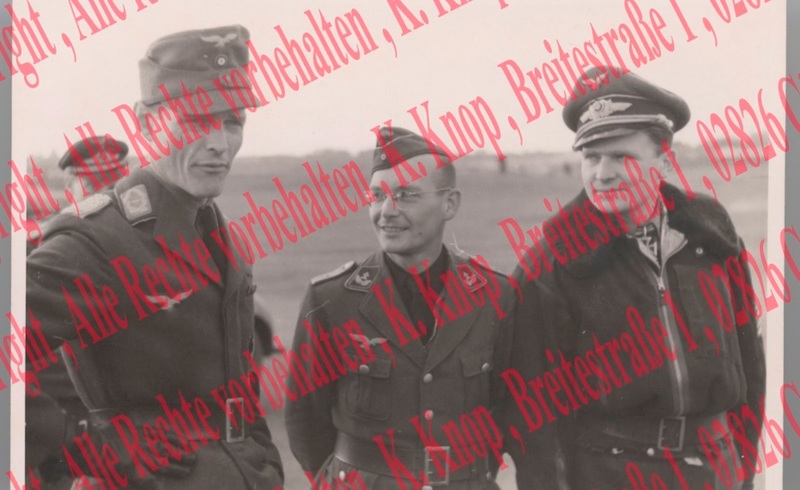 18.10.43 Maj., appt Kdr. II./SG 1? (to ?). REUSCH, Ernst-Christian. (DOB: 10.09.16 in Wiesbaden). (R, DKG). 09.39 in St.G. 1. 04.02.42 Oblt., awarded DKG, II./St.G. 1. 01.11.42 promo to Hptm. 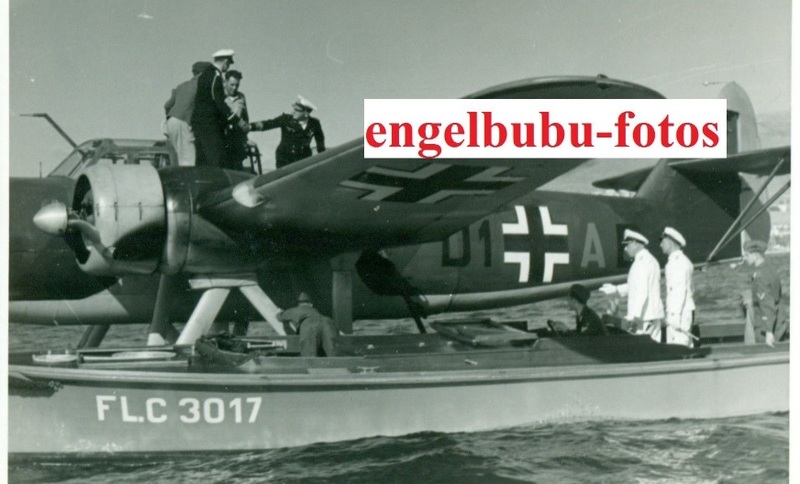 03.11.42 awarded Ritterkreuz on basis of recommendation made while Staka 5./St.G.1 21.10.43 appt Geschw. Adj. and Ia of SG 1. 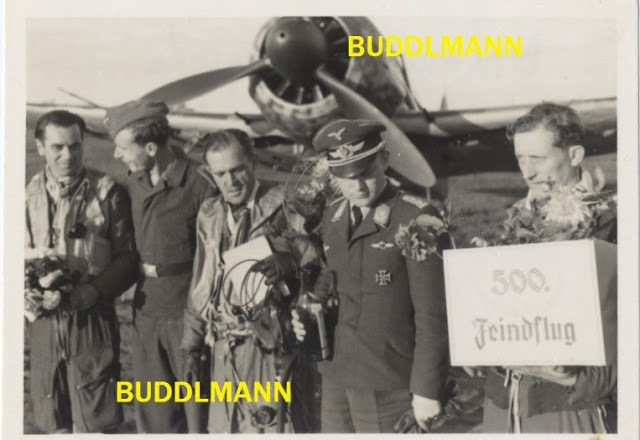 01.05.44 Hptm., appt Kdr. II./SG 1 (to 21.01.45 WIA). 01.11.44 promo to Maj.
Reusch was severely injured during a forced landing following engine failure of his Fw 190 F-8 shot down S of Mohrungen. 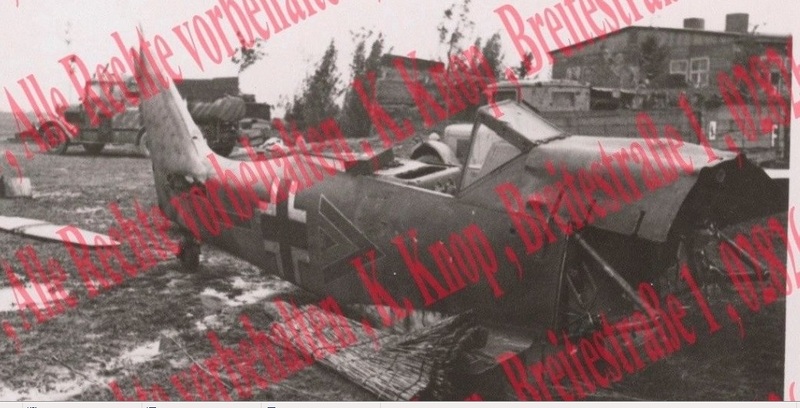 †26.01.45 in a hospital in Danzig of his wounds. Buried at Rahmel, near Gdingen. 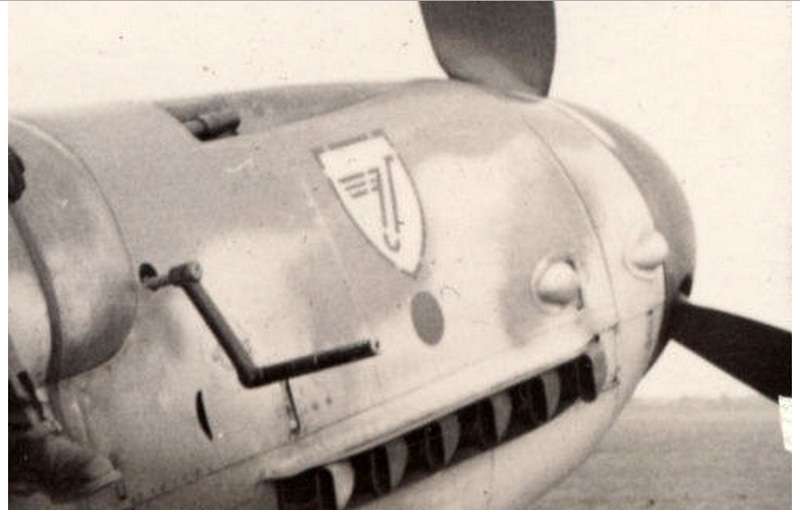 Credited with 765 combat sorties. 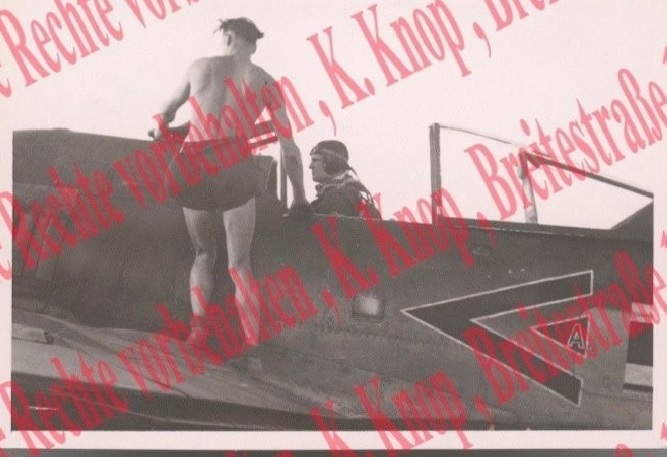 A number of views of Reusch in his Fw 190 F-8 Kommandeur machine 'double chevron A' with wing-racks faired over, universal wing (outer wing cannon bulges, no outer wing armament fitted.
" ..a series of original photos taken by LT. COLONEL Alan D. CATTERALL in and around Neubiberg aerodrome. He served in the 32nd Service Group and later commanded the 492nd Air Service Group. 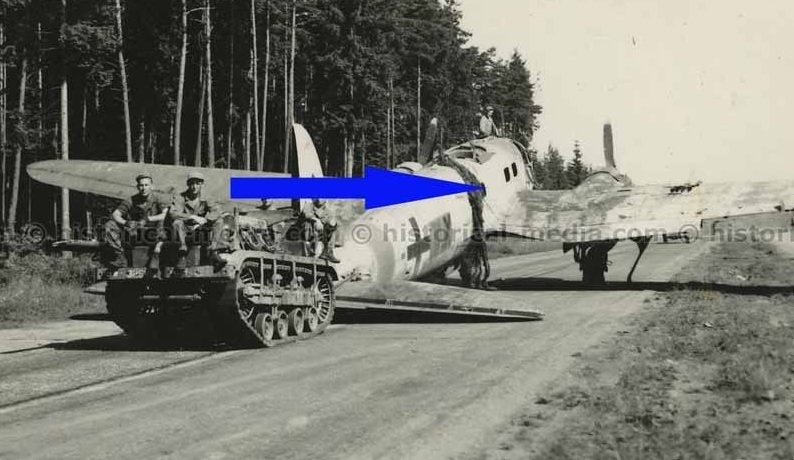 This unit was responsible for decommissioning and scrapping captured Luftwaffe aircraft. This is a super rare original photo - NOT a reprint!..." 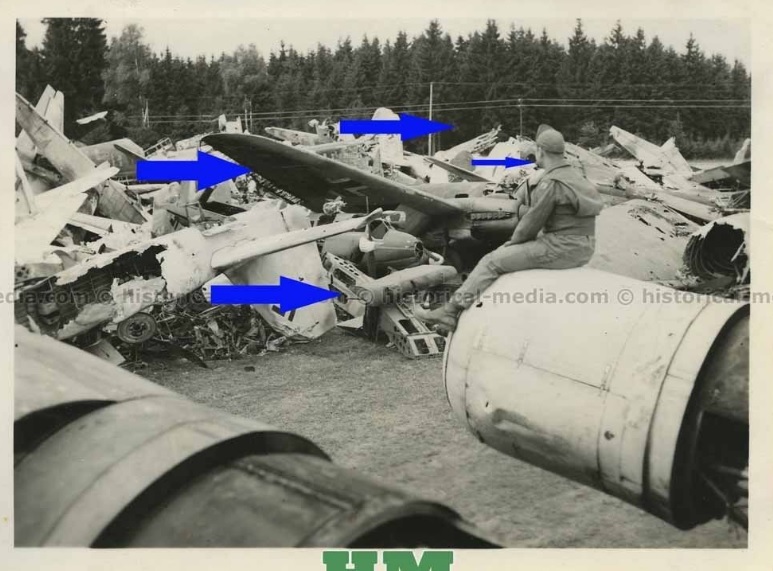 Above; Luftwaffe aircraft wrecks at Neubiberg during September 1945. The airfield at Neubiberg was dubbed 'Camp Rattle' following its capture in April 1945. 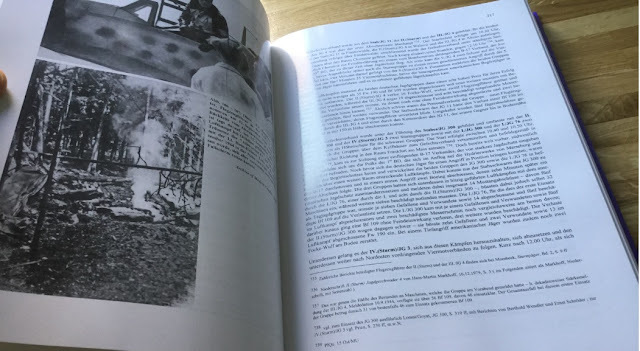 Giancarlo T. Tomezzoli (2016) The “Fliegerhorst” of Neubiberg (Munich-Germany) in Archaeological Discovery 04, pages 69-86. Soltau, G. (2005). Die Fliegerhorst Neubiberg Im Spiegel der deutschen Luftfahrtgeschichte. Oberhaching: AVIATIC VERLAG GmbH. 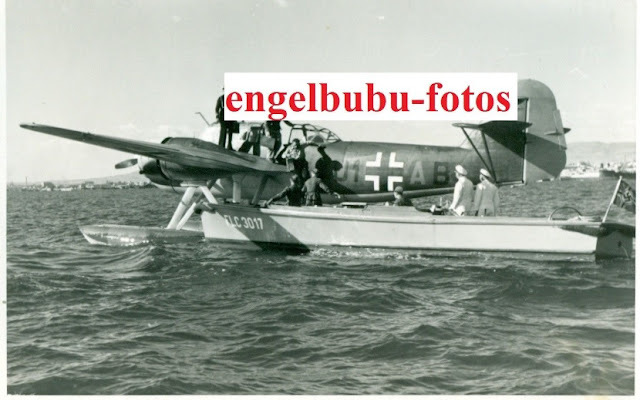 The Fokker T.VIII-W was a twin-float twin-engined torpedo bomber and reconnaissance sea plane designed in 1937 for the Dutch Naval Air Service (Marine Luchtvaardienst, or MLD) which saw service in small numbers in both the Luftwaffe and the RAF during 1940. By the time of the German invasion of the Low Countries in May 1940 eleven had been delivered to the MLD and others were still on the production line. 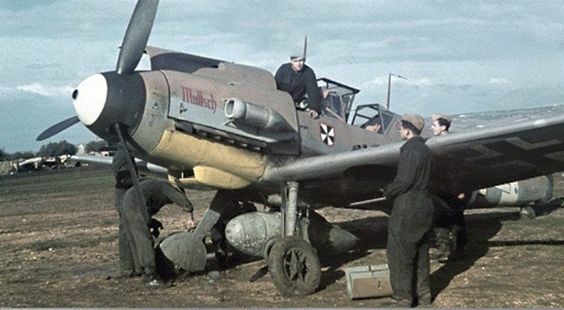 The Luftwaffe ended up with twenty-five T.VIIIs, which they used on anti-shipping and reconnaissance patrols and for air-sea rescue over the North Sea and Mediterranean. 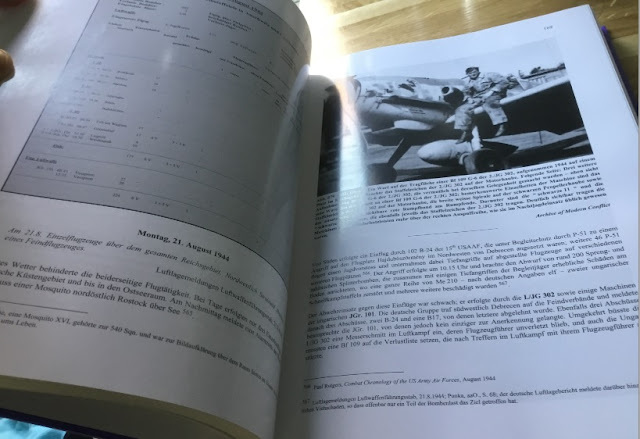 A number of serviceable T.VIIIs escaped to France on the German invasion before eventually crossing the Channel where they equipped No.320 (Dutch) Squadron of Coastal Command.